Covering three luxurious levels, this three bedroom penthouse apartment offers the ultimate in space and features. Apartment 1’s ground floor has 2 bedrooms with a king bed and 4 singles, a separate bathroom and its own lounge area and courtyard. The first floor has the ensuited, king sized master bedroom and a large living and dining area with a fully appointed kitchen, plasma tv with Foxtel, dvd and cd players and ocean view balcony. This apartment is tastefully furnished in such a way as to let in the light and the breezes, creating that feeling of a true beachfront retreat. The second floor is a private oasis with a huge rooftop terrace boasting exceptional views of Byron’s Main Beach. It is perfectly designed for entertaining with a six seater dining setting, lounge chairs and a BBQ and kitchenette. 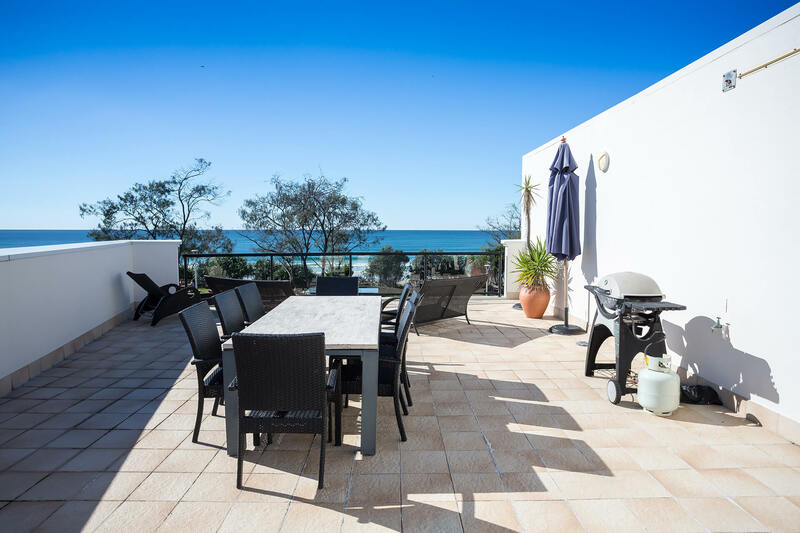 Located in the heart of Byron Bay, Bay Royal’s 3 level penthouse is a luxurious spacious apartment allowing you to experience the best that Byron Bay has to offer in style and comfort. As fitting this wonderful resort location, Bay Royal features a full sized flood lit tennis court and a sparkling swimming pool. All of this and you are only steps away from the patrolled Byron Main Beach.